There should be no understating the importance of healthy hooves to the equine. We rely on these four relatively small but vital parts of the horse in order to be able to do just about anything with our beloved friends. The health and functionality of the four feet can mean the difference between a sound horse and one who is unrideable. In order to be able to try to achieve a suitable hoof-care regime and to maintain a sound and comfortable horse, we need to have an understanding of the equine hoof – both inside and out. 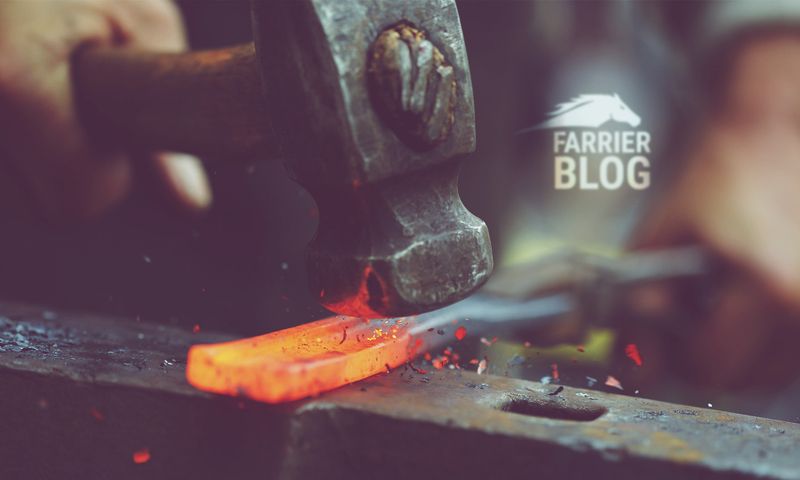 One of the most significant functions of the outside of the hoof capsule is protection. That is, protection of the internal structures. Most of the various parts that make up the outer hoof are relatively hard but many also have some flexing properties that allow the hoof to remain healthy and maintain functionality. The hoof wall itself is a continuation of skin – it is made up of some similar elements (such as keratin for example) but has a firmer texture. The hoof wall grows from the coronet area (explained later) and is made up of a series of horn tubules which run from top to bottom. These horn tubules are closely locked to each other to make up the hoof wall. If you look very closely at the outside of a (clean) hoof wall the horn tubules can be visible to the naked eye. Pick up some freshly cut hoof and it’s also often possible to see the ends of the tubules in an off-cut. Similarly to the outer wall, other parts of the outer structures also are also often referred to as being “horny” and perform protective functions too. These include the horny frog and horny sole. The horny frog has many other functions other than merely protection. This includes acting as a pump for the blood circulation around the hoof capsule (and back up the leg towards the heart). The frog, which is a rough v shape underneath the hoof, is also pivotal in allowing the expansion and return of the hoof capsule when the hoof is weight-bearing and under load. Although it is considered horny, the frog is softer in texture to the outer hoof wall. It acts as a shock absorber for the rest of the foot by helping to transfer many of the forces to other parts within the hoof capsule (the internal digital cushion for example). 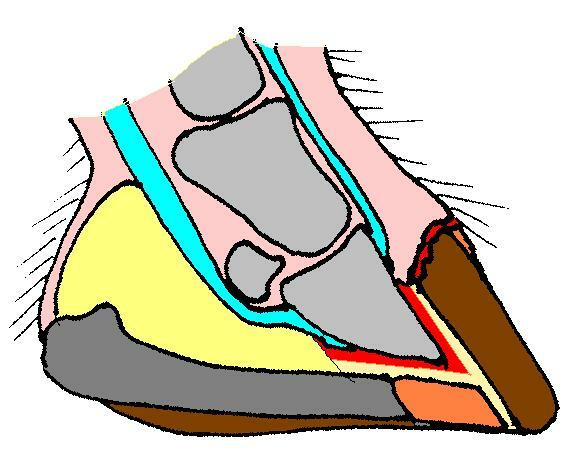 The coronary band (also known as the coronet) is the softer area at the very top of the outer hoof wall in between the hoof wall and the pastern. This coronary band is where the new hoof wall is grown from and is highly vascular – cutting or injuring this area can produce surprising amounts of blood. A severe injury where the coronary band is permanently damaged can impede the hoof growth from that point. It is relatively common to see horses in New Zealand who have been injured in a wire fence and have damaged the coronary band (at the heel area for example). As a result, some of these horses have a visible line down the hoof from where the injury at the coronary band occurred. This line is almost always a weaker area compared to unaffected horn and can sometimes crack. Whilst the function of the coronary band involves the complex generation of new horn; farriers, vets and horse owners can also use it as a guide when assessing the balance of the hoof. The shape should have some uniformity. There are certain properties we look for in the coronet when assessing angles and hoof balance. For example, a coronary band which dips or rises at a certain point (often just before the heel) will suggest some correction or changes are required to the trimming/shoeing. Ideally, the coronary band should follow a gentle slope from the toe area (where it is at its highest) downwards towards the respective heels. Another common visible marker which suggests balance issues is the coronet dropping radically at the heel area. This is often associated with a contracted foot which needs the heels lowered. Other important parts of the outer hoof include the sole which is as the name suggests, on the ground surface and interlinks the hoof wall, frog and heel areas together. The sole is another horny area with functions which include protection. This article by David Hankin first appeared in NZ Horse & Pony magazine in 2010.